Greeting Cards is rated 4.5 out of 5 by 33. Rated 5 out of 5 by Jan88 from Great job. Beautiful job on our greeting card. Very good price and fast turn around. Rated 5 out of 5 by Bryan from Pleased Extremely fast reproduction. Excellent customer service. Best Pricing. Rated 5 out of 5 by Mark M. from Nice Quality Bought 500 greeting cards with envelopes. They came shrink wrapped in bundles of 10. My graphic was perfectly printed on a nice quality stock, scored for folding and shrink wrapped with the appropriate number of envelopes. I'm a happy customer! Thank you! Rated 2 out of 5 by Agagnet from So late The cards are ok. Not matte, shiny. And they showed up in TWO WEEKS with no explanations. 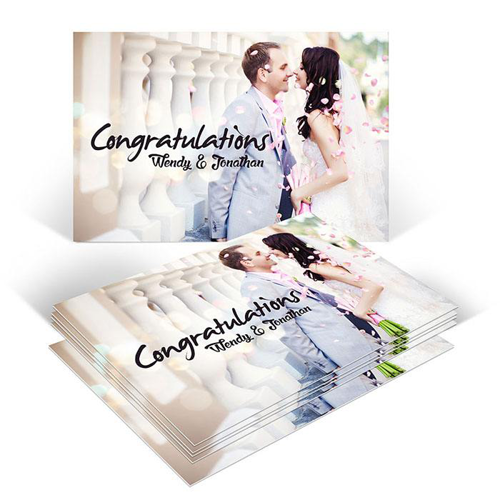 Greeting card printing is a secret weapon of successful marketers everywhere. Contrary to popular belief, they’re not just for reaching out to loved ones over the holidays. They’re the go-to holiday marketing tool for congratulating new customers and for keeping in touch with regulars. They add a personal touch no other marketing tool can deliver. Greeting card printing can be used for birthday cards, Christmas cards, or for any important occasion where you want to reach out to customers. Greeting cards can be printed in a flat or folded style. Cards comes in three sizes: 8.5” x 5.5” (folds to 4.25” x 5.5”), 11” x 8.5” (folds to 5.5” x 8.5”), and 10” x 7” (folds to 5” x 7”). Blank envelopes and shrink wrapping can be included in your order. Greeting cards are printed on durable 14 pt. stock in your choice of coating on one or both sides. Coating in gloss, matte, or high-gloss UV (on one or both sides) can be provided to give your cards additional protection. For accurately printed and trimmed greeting cards, be sure to download our greeting card templates in the right size, orientation, and format you need. Using the templates ensures your designs are at the correct scale and that none of your greeting card artwork is trimmed or folded in the wrong place. Why not start to make your own greeting cards now.